For us, racing and training are a family affair. When we're not busy training, we are raising our 2 boys and/or working as partners in our art business. Our boys, Storm & Steel crew for us during our longer races. 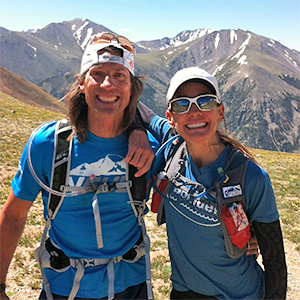 In 2014, Marc and I crossed the finish line of the Leadville 100 Series for the 3rd time together, becoming Leadman & Leadwoman for our 3rd consecutive year. We've been dubbed the "Leadcouple". Guilty Pleasure: Ride bikes all day long and even into the night. Best thing about VFuel: Tastes Great! Favorite trail running memory: Crossing the finish line of the Leadville 100 Run together to become Leadman & Leadwoman. Both of us couldn't stop the tears coming down our faces. Then my 16 year old son had to carry me (KT) to the car because I could no longer walk.